1. It has already been a month since Clara was born! Time flies, and I know according to what other parents have told me that next thing I know she will be graduating from high school. In the meantime, our house has been adjusting more to having two little girls. 2. Amelia paid almost zero attention to her doll before Clara was born. 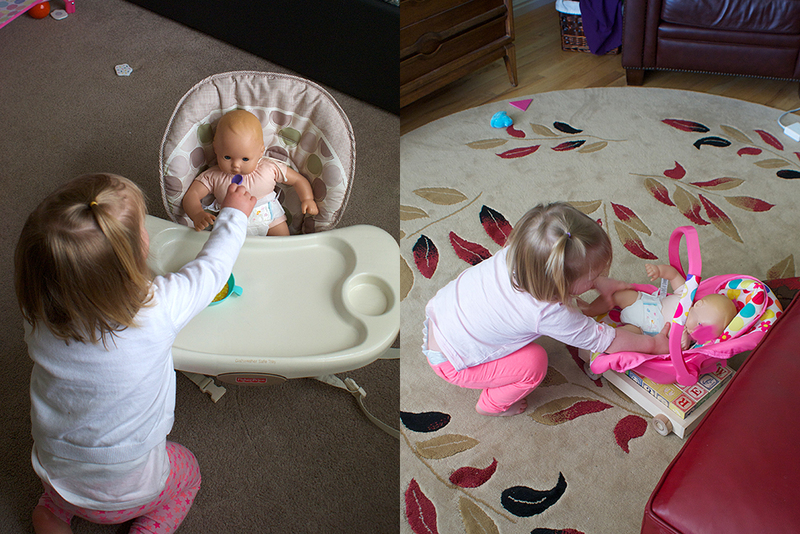 Now she can't get enough of playing with her and pretending she is real. It's pretty much adorable to watch her feed her doll "mac n' cheese" and buckle her up in her car seat for a trip. Though watching her throw the doll around by one foot is not convincing me to let her babysit any time soon. 3. We've slowly been getting Amelia's new room ready for when baby sister takes over the nursery from Amelia. 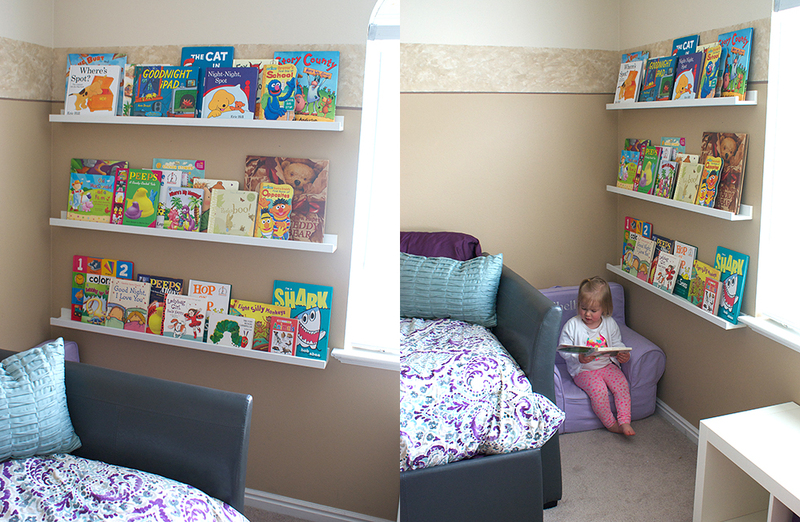 Since she loves to read we put up some picture ledges from Ikea as bookshelves and Amelia loves being able to see so many of her books at once. She actually arranges them on the shelf - true story. Something tells me this is the last room we are going to be able to put together without her having a say in the decor. 4. I bought lace almost a year ago because it was 10 cents a yard at a going out of business sale and I had visions of using it as a border in the nursery. I had no idea how that was going to happen but finally researched it online and did you know you can stick fabric on the wall with liquid starch? It works really well and is a great non-permanent way to decorate a room. And of course this is what I chose to do with my time this week when necessary things like laundry and grocery shopping seem to be difficult to find time for. Priorities. 5. All it took were a couple big grins from Clara and Amelia is now okay with her existence. She still is totally jealous when mom is holding her and sometimes walks around using Clara's pacifier, but she is paying more and more attention to her now. She doesn't seem to understand that Clara can't do much at this point, but once Clara figures out the use of her limbs more, Amelia is read with games and toys. 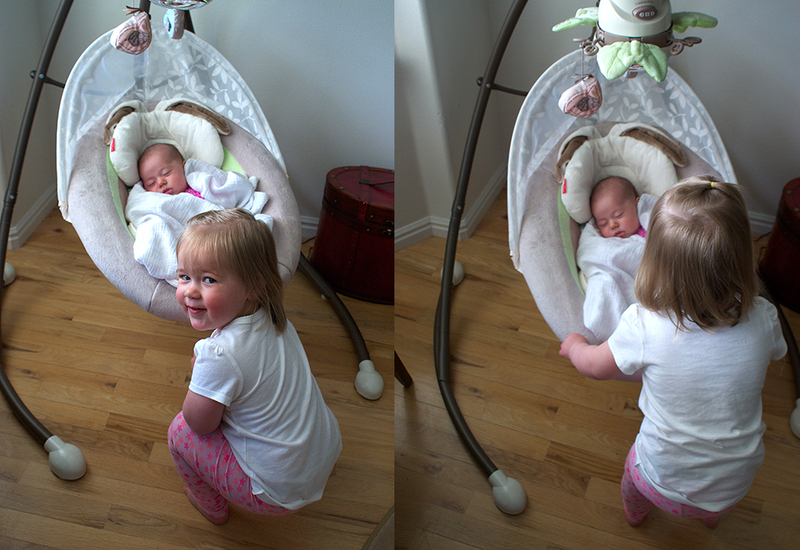 Until then she "helps" Clara swing, brings her burp cloths and spends time trying to get her to smile. It's adorable. Your daughters are so adorable, and I'm glad to hear you're adjusting so well! I love Amelia's room and those bookshelves...darling! I love the idea of those shelves. Where did you buy yours? They are picture ledges we bought at Ikea. We've loved them so far. I love that they are starting to bond! How cute. I remember bringing my son home and my daughter being the same with her dolls. She was never much of a baby doll kid, she did like her barbies though! lol Love the lace boarder!! Great idea! Hooray for adjusting to have two! That reading nook is too adorable - glad you are able to still cook up some delicious looking food with all you have going on! Congrats on adjusting to life with two little ones! I don't know how you do it...i'm so nervous about just having one :) I absolutely love that lace border! And that little grin from Amelia in that bottom pic is totally adorable....glad she's learning to "tolerate" her sister.